It is expected that mild-steel prototypes will make their appearance some time next month. Under optimal circumstances, low-rate production might commence in September, but that presumes no issues in testing. I'd expect no large-scale production before 1943.
i wonder why this tank will be developed without WW2. No war showed that the other tanks aren't sufficient against the other tanks. In OTL the Panther was the 1:1 answer of the T-34. 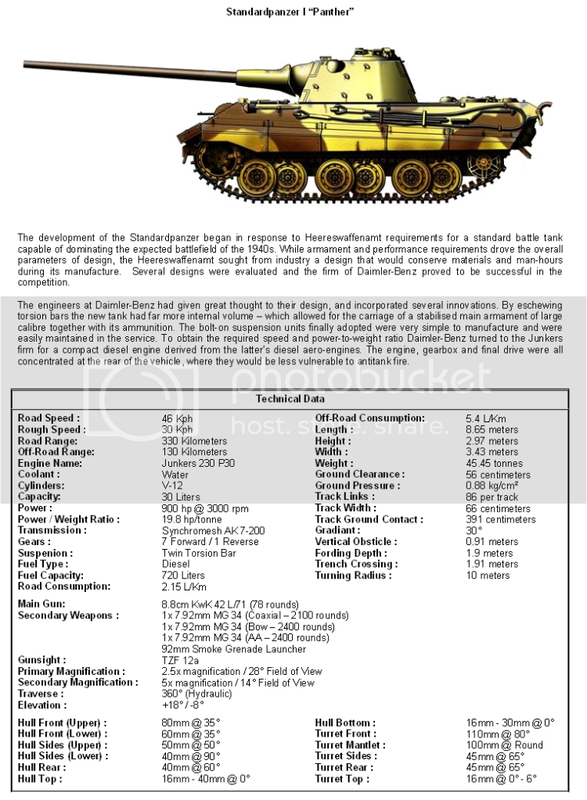 While there is no combat experience to demonstrate that the current Panzer IV could not deal with the AT-36 or AT-37, the question is not so certain for the Bharati Arjun tank, and the Standardpanzer is expected to be able to cope with the next generation of tanks - like the French Montbrun and the expected Char-13. If one waits for a demonstrable need for a weapon on the battlefield - to counter one the enemy already has in numbers - it is too late. It is worth remembering that the OTL Leopard I and Leopard II were both designed without direct combat experience, yet they are regarded as some of the best tanks of their generation. Yup, which means the Char-13 will be of the same generation. Though I've not released the full specs yet (nor indeed fully decided on my specs), it'll make for an interesting comparison with the new Panther - comparable vehicles that are the result of different national theories about tanks. breathe easily today. Countries planning aggression against Russia intelligently do not design tanks with operational range of only 130km cross country. Countries that design such tanks are either not planning aggression against Russia, or are doing it very badly. Given the recent change of direction in French tank doctrine, the Char-13 should make an interesting comparison with the Standardpanzer. The most recent French tanks (Bruyere, Montbrun) are a definite break with the past (Renault 35, Somua 35) but seem to represent an interim phase - even though the vehicles perform well. The Char-13 should embody the revised doctrine in a much more effective package. If one waits for a demonstrable need for a weapon on the battlefield - to counter one the enemy already has in numbers - it is too late. Permit me to illustrate your argument with a chart. I have pulled together the vital specifications of five of Wesworld's medium tanks. (I shall add Atlantean, American, and Italian tanks later, and I've no data for post-1935 SAE tanks.) It can be seen from the paper comparison alone that the Panzer IV, while a good tank in its own right, would be challenged by many of the tanks currently in service elsewhere in Europe and Asia. In other words, if Germany did not advance their tank design in some way or another, then it would be criminal stupidity. Permit me to illustrate your argument with a chart. Thank you; it makes the point quite clear. While good training and good doctrine can outweigh technical factors (ie. IDF Super-Shermans versus Egyptian T-54s etc) to ignore technical developments elsewhere is unwise. Updated the chart to add US, Atlantean, Japanese and Italian tanks. The newest Italian tank doesn't have much in the way of hard specs, unfortunately. Tanks seem rather well along for early 1942. Ironically, while my 'military equipment progression' is mostly complete, if there is already a 90L50 gun in service, it looks like I'll have to add yet another tier for the late 1940s. As you can see, the Argun-C is comparable in quite a number of ways to tanks which date to 1945 or later. Oh I agree. Many of the tanks in the first chart - all already in service in 1941- are rather advanced compared to OTL. OTL the Pz-IV F2 75L43 was just rolling out in March 42. The Argun is just further in advance. This leads to such things as the Irish considering the 57mm obselete in their RFP. It's a rational evaluation given the "medium" tanks out there. In my case I was going from a mid 1930s 45L48 to a 60L50. With the turret ring on the T-35 maxed the next step was adding Iberian tungsten cores. For towed ATGs that will stay for a bit, but for AFVs- a new tank- using the heavy chassis & drivetrain commenced in 1936, would first mount the FRC-Bourges 75L54 and then later..I thought at the end of the 1940s/early 1950s- the FRC 90L60 on a T-44 or Centurion. However, that handy dandy chart indicates things are 3-4 years ahead, so I need to allow for a 100L55 gun in the final stage of the progression. I fear you misunderstood the reason the Irish asked for a 75mm gun. They don't think the 57mm is obsolete - it's just that their experience has de-emphasized tank-versus-tank combat. The 6-pounders they used in Afghanistan were good versus other tanks - on the two occasions they fought other tanks - but against the majority of targets the Irish actually fought, they were not that useful. They want a 75mm gun because it'll have a bigger HE shell to cause more damage against soft targets like Afghan horsemen. Yes its a very interesting chart indeed. I would point out that while the WW M4 Sherman does compare favourably with the other medium tanks available, the US is only now beginning to introduce them, so numbers wise at least the US currently is at a disadvantage, other nations having at minimum a year's worth of production whereas the US is only beginning its planned short run of M4's. I fear you misunderstood the reason the Irish asked for a 75mm gun. They don't think the 57mm is obsolete - it's just that their experience has de-emphasized tank-versus-tank combat. Yep, misunderstood what you were driving at. Looking at the armor on the current mediums, a 57mm will work well vs some...and not at all vs. others. The Belgian 60L50 has similar issues and will not be very effective past 500yds. The Dutch addressed the HE issue much way the OTL Brits did- with the T-35B with a 75mm gun/mortar. Edit : Actually, looking at the M4, I'd say it's average. Less KE gun than most, middle of the pack armor, low end Pwr/wt, OTL PSI was ~12.5, fairly tall, ok speed, short range. I suppose I should observe that way back when I had tanksharped an "Assault tank" for 1941 to be the Dutch Tiger entry - the LT-41A. 42 tonnes, 6.5m long with a top speed of 28kph. Heavily armored at 100mm+. Side effect of construction style was Tanksharp says it's bazooka resistant. Big and slow. This was to be the tank that first sported the 75L54 FRC gun, followed by the 90L50. My "typical" Dutch PSI of 8.5 would at least allow it to get around easily in shell torn muddy fields. However, that wasn't to be the "standard' tank, but the heavy breakthrough tank. All very true, but the basic vehicle was capable of being churned out rapidly and could be upgraded substantially. Easy maintenance and good reliability were also selling points, and the bulky hull had a good sized turret ring that allowed upgrading. Also fit between decks on liberty ships. But...76mm of Cast armor <> 76mm of RHA or facehardened armor. A 75L40 has a lower MV than a 75L48. Etc. Hence middling. Overall I'm not sure "churned out rapidly" is a big concern for most peacetime armies with big oceans around them.